1) CONFESSIONS BY TORTURE: The first generation of modern criminologists, in the 1880’s and 90’s studied interrogation techniques, and found that torture was useless. Hans Gross, the great Austrian criminologist, wrote that people subjected to torture and even high-pressure techniques would either lie or tell the investigator what he wanted to hear. Gross wrote that the smart investigator should never show anger; but maintain a neutral, almost beneficial stance, persuading the subject to “unburden” himself. Yet despite the work of Gross and others who followed, people have continued to interrogate with torture. 2) CSI SCANDALS: Last year the National Academy of Sciences urged that in order to eliminate pro-prosecution bias, the nation’s crime labs should be separated from police departments and re-established as independent entities. That suggestion reflects the requirements established more than a century ago by Dr. Alexandre Lacassagne, a pioneer in forensics and criminal psychology, and founder of the Institute of Legal Medicine in Lyon, France. He insisted that crime labs should be independent bodies, preferably situated in universities and other research institutions. The standards he instituted were a model of how we should operate today. 3) THE INSANITY DEFENSE: Before the advent of modern psychology a judge or jury could find a man insane simply by observing that he was a raving lunatic. But the growth of the new science in the late 19th century made diagnoses increasingly subtle: for instance, a man could seem normal but still harbor uncontrollable homicidal impulses. So the prosecution summoned expert witnesses to testify as to a defendant’s sanity. Eventually the defense turned to its own witnesses, and a courthouse cycle of dueling experts began that continues to this day. A key question haunts us in the case of serial killers: How could such people not be insane? Yet even today as a century ago, virtually all serial killers are found sane and legally responsible. 4) CRIME AND THE BRAIN: Using MRI scanning techniques, modern scientists are finding surprising anomalies in the brains of psychotic killers. In some of these people the pre-frontal cortex – the area associated with self-control and higher thought processes – fails to control signals from the amygdala – the primitive, impulsive part of the brain. In short: certain people may have a neurological inclination toward crime. The discovery could someday give a whole new meaning to the definition of legal responsibility. 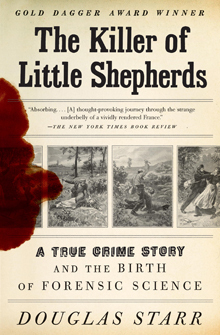 More than a century ago, the scientists in The Killer of Little Shepherds also researched the link between brain structure and criminal behavior. Dr. Moritz Benedikt of Vienna, a neurologist and criminal psychologist, spent his career dissecting the brains of executed criminals in an effort to find the brain structure that controlled morality. He died without finding an answer to his quest. 5) NATURE/NURTURE: One of the enduring debates of the 1890’s was the existence of “born criminals” – people genetically predisposed to crime. Dr. Alexandre Lacassagne believed that upbringing caused crime, but many other scientists thought the tendency was inborn. In every generation since then the argument has been revisited, often with flawed science — from the infamous Juke and Kallikak studies of “born criminals and idiots,” of the late 19th and early 20th centuries, to the “XYY gene” link to criminality. The argument continues.